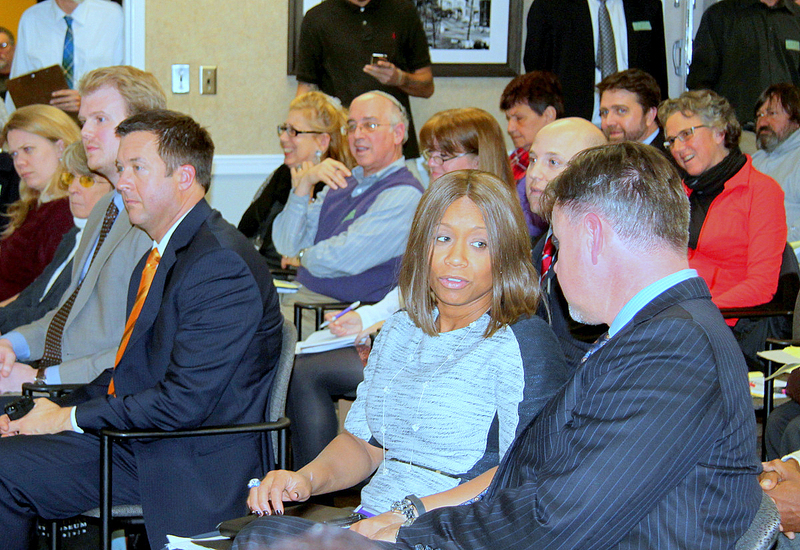 Above: Walmart lobbyist Lisa Harris Jones and Sean Malone confer at last year’s Planning Commission hearing on 25th Street Station project. Seawall Development Co. may have purchased 25th Street Station and dropped the big-box plan approved for it by the city, but that doesn’t mean the would-be-anchor-store, Walmart, has thrown in the towel. It just happens to be in a building on Maryland Avenue owned by Walmart’s lobbyist (and top city lobbyist and mayoral friend) Lisa Harris Jones. 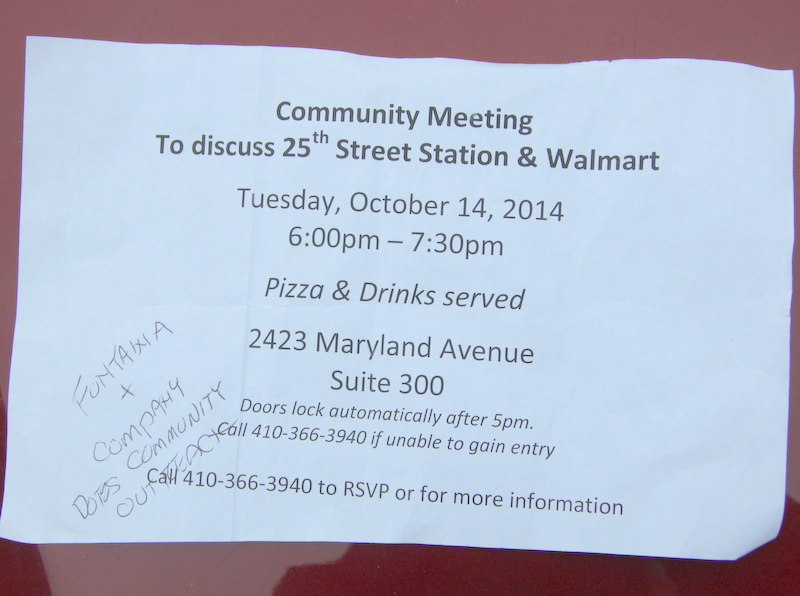 The flyer promises “pizza & drinks served” at the meeting, scheduled for tomorrow evening. As for the specific phone contact for the meeting, that would be Fontaine & Company, a “grassroots advocacy and public affairs” firm retained by Walmart. Last November, Fontaine bused a group of sign-waving pro-25th Street Station residents – at Walmart’s expense – to a key vote by the Planning Board that moved the controversial 25th Street Station project forward. Jamie Fontaine, whose office is on the third floor of the Harris Jones Malone building, was part of the retail behemoth’s team effort at the November meeting. She was in the back organizing residents, while Jones sat prominently in the audience with her husband and lobbying partner, Sean Malone. Jones and Malone reported being paid $8,000 last year as Walmart’s lobbyist at City Hall. Reached by The Brew last night, Jones said she didn’t know anything about the meeting in her building, but referred a reporter to founder and president Fontaine. A message left for Fontaine at her office has not been returned. 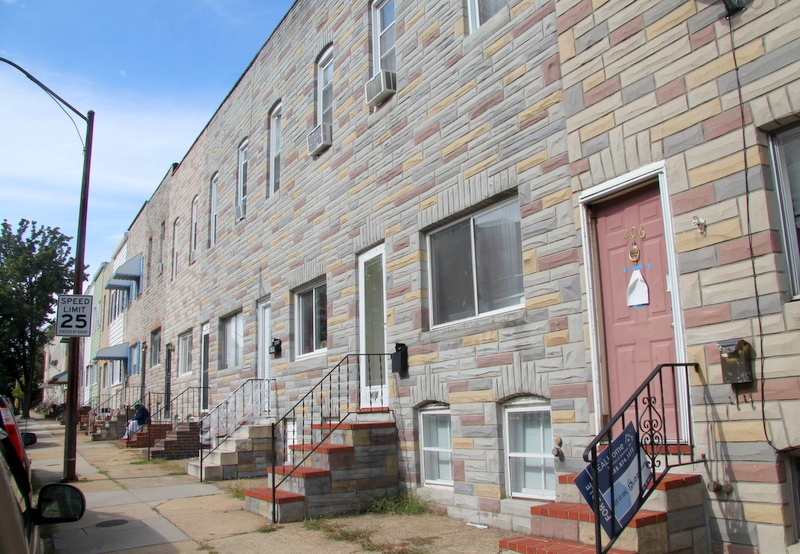 Jones had said she had “no comment” on whether Walmart still has hopes of putting a store at the 25th Street Station site now that the North Baltimore property has a new owner. “I’m not authorized to speak to you on behalf of my client,” Jones said, promising to forward the name of someone who is. Community leaders who have been critical of 25th Street Station – and say they were assured verbally by new owner Seawall that they would not let a Walmart come in – were dismayed over the weekend to learn the company is still pushing to be involved. Supporters and opponents of the shopping center alike concluded that Wal-Mart was out earlier this month when Seawall’s interest in taking over the project, reported last May, was confirmed. “Yippee!!!! Good riddance Walmart, you bring nothing of value to the community,” a Facebook commenter, Kris Northrup, wrote. At Atomic Books in Hampden, an October 1 fundraiser to support a lawsuit against the project erupted into cheers upon hearing news of the completed sale. Since then community leaders had remained confident, even though Seawall principals have stated publicly that anything, including a Walmart, is potentially on the table. Cross said he received verbal assurances from Seawall that their company, known for historic mill renovation and other adaptive re-use, would not include Walmart in any future project. He said obtaining that promise was an important prerequisite for his group before signing a Memorandum of Understanding with the property owner who sold to Seawall, Bruce Mortimer of Anderson Automotive Group. Messages left for Seawall principals, Thibault Manekin and Evan Morville, have not yet been returned. Mortimer needed the group’s blessing for a plan that would help purchaser Seawall move forward with its Remington Row project – they needed Mortimer to agree to relocate his body shop on Remington and 29th to 25th Street.